Carl Vinson served in the United States House of Representatives for 50 years — the longest continuous service in history — from 1914 to 1964, a tenure that extended during the terms of nine presidents from Woodrow Wilson to Lyndon Johnson. He was a fervent believer that peace can only be maintained if the country's defenses are strong. Mr. Vinson was known as one of the nation's most stalwart and influential supporters of a strong national defense. He was chairman of the House Naval Affairs Committee for 16 years and of the Armed Services Committee for 14 years. In matters of national defense his influence came to be regarded as second only to that of the President. Bibb County, and he was instrumental in the location within the middle Georgia area of many projects of great benefit to Macon. He was primarily responsible for the construction of Robins Air Force Base in Warner Robins and played a leading role in assuring that I-75 and I-16 passed through Macon. 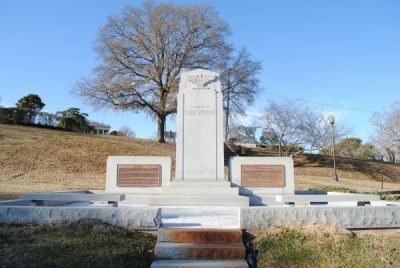 Mr. Vinson was a leader in founding the Mercer Medical School, and his efforts were vital to the construction of Lake Tobesofkee, the construction of Cochran Field (now Macon's Municipal Airport), the new Federal Building on College Street in Macon, and the Naval Ordinance Plant, the reactivation of Camp Wheeler near Macon during World War II, and the naming of a dirigible and naval vessel for the city of Macon, all came about primarily as a result of his efforts. Carl Vinson was born November 18, 1883, near Milledville, Georgia, and spent his formative years in that city. After his graduation from Mercer University Law School in Macon in 1902, he practiced law, was appointed Baldwin County Court Solicitor, was elected to two terms of the Georgia Legislature, and served as Judge of Baldwin County Court. A life-long Democrat, he was elected in 1914 to the U.S. House of Representatives and was sworn in November 5 of that year as the youngest member of Congress. From 1917 until his retirement, Mr. Vinson was a member of first the Naval Affairs Committee and then the Armed Services Committee into which the Naval Affairs Committee was merged. Throughout that time he played a leading role in defense matters, and his influence was enhanced in 1931 when he became chairman of the Naval Affairs Committee and in 1949 when he became chairman of the Armed Service Committee. "… My country and its safety come ahead of any party…"
These two principles and his belief in civilian control of the military guided him throughout his career. Funded By: Friends of Carl Vinson-$30,000-private funds.